Due to Berwick Rangers’ rearranged home SPFL League Two game against Stirling Albion taking place in the same week, this Development League match was switched to the Indodrill Stadium leaving Alloa to come south later in the season instead. Rangers’ Kyle Scott was a spectator after receiving a bad ankle injury playing for loan club Penicuik Athletic at the weekend. There were two trialists in the Berwick squad, one replacing the other in the second half. Berwick might have notched the first goal after only five minutes. Ally McDonald sent Gary Dolan through on goal but keeper Andrew Wilson got the better of the one on one. Berwick kept up the pressure and two minutes later Wilson was beaten by a perfectly struck shot from Jamie Chapman. In the 12th minute, the Wasps defence was again found wanting. Ryan Porteous swung over a cross from near the left touchline. Beyond the far post, Dolan managed to keep the ball in play before knocking it back to the trialist No.10 to complete matters. He came close to getting another, only a deflection taking the ball off course after he juggled it with his feet before shooting. The trialist was also the link man in the 19th minute after McDonald robbed Adam Martin but Wilson saved from Daniel Watt. 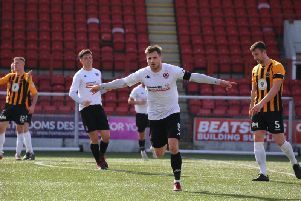 Scott Hynd tried to convince referee Evan Cairns that he meant no ill intent but still picked up the night’s only yellow card for sending Dolan flying, this ahead of Berwick’s first close call after 24 minutes when a header flashed wide from a free-kick. It was the cue for Alloa to present more of a challenge, though Grant Goodfellow’s first save was to push away a defensive header from team-mate Porteous which was travelling in the wrong direction. After a home corner in the 34th minute, Goodfellow’s foot stopped the ball on the line. Next, he twisted to tip Hynd’s shot on to his post. In the 39th minute, his foot again stopped the ball on the line but this time, John Cunningham sent it back to make it 2-1. The two-goal margin was restored just five minutes into the second period. Two players got a touch before Dolan turned neatly inside the box to give himself the space to go on and beat Wilson. Dolan soon added another. The trialist found Porteous on the left, no home player got near the ball he sent behind the defenders, allowing Dolan a routine finish by the far post.